A practice session. Photo: Courtesy AIFF. As a junior, Abhishek Yadav had little idea of what it took to play professional football in India. If it hadn’t been for a few chance occurrences, the striker, who represented the national side for close to a decade, could well have been a relative unknown in the larger scheme of things. Since donning the role of an administrator with the sport’s governing body, All India Football Federation (Aiff), a couple of years ago, he has been trying to ensure that youngsters get a chance, especially with the Fifa under-17 (U-17) World Cup on the horizon. When Stephen Constantine started his second stint as head coach of the national team in 2015, he sought to set up a scouting system in the country. In Yadav, who had made his debut under the Englishman and had recently called time on his playing career, he saw the perfect candidate to execute his plans. “See, scouting hota to rehta hai (scouting has been going on in India) but it was never structured; Constantine wanted to work on this. 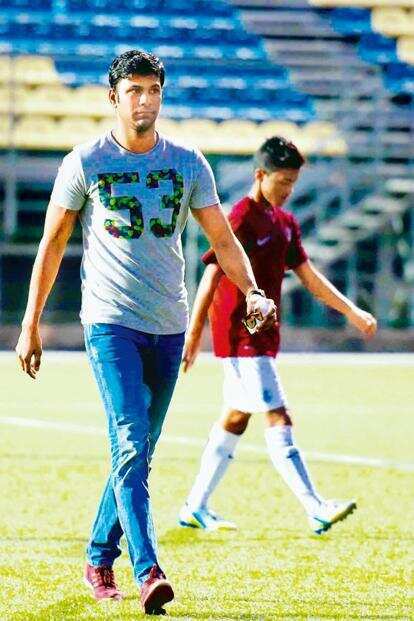 He knows Indian football well since he’s spent time here," the 37-year-old says. The duo got talking in the latter half of 2015 and then approached Aiff with their proposal. Yadav soon came on board as the director of scouting for the national teams. The immediate focus was the U-17 World Cup scheduled in India this October, and Yadav had his task cut out as the team’s chief operating officer (COO). He discovered that it was more difficult to locate junior players. Over the years, the senior boys had had the I-League and the Indian Super League as a platform to showcase their skills, but there weren’t many avenues for the younger lot. In fact, a few players in the current U-17 squad weren’t playing anywhere when he first spotted them. There was an immediate need to create a pool of players and Yadav and his team of three toured the country in 2016 to find them. They located players through scouting camps and exhibition games, preparing an extensive database that made note of their strengths and abilities. “I have seen close to 10,000 boys for the U-17 side, some of whom were invited to the camp but eventually sent back. See what you have done for the boys though—spending a week with the national team would not only encourage them to chase football with passion, but they would also infuse the same energy in their friends. A lot of the players in the current squad have come through this exercise, though I know there are a lot of boys still out there waiting to be discovered," Yadav says. Yadav’s prime focus was to make these tryouts accessible to as many boys as possible. In Maharashtra, for instance, there were six centres across the 33 districts, and players came from as far as Yavatmal, Sangli and Burhanpur. Yet there were times he felt his plan wasn’t without its drawbacks. “I saw a very talented boy in Kolkata. He had travelled 4 hours to just get to the camp. I wondered when he had eaten his last meal, and about his physical state when he was called on to play. His shoes were patched up in 10 places, yet it hardly mattered on the ground. It’s not easy to perform in such circumstances. As an ex-player, it is my responsibility to give them a good experience and encourage them if they have the belief that they can make it," he says. This got Yadav thinking about a few untapped opportunities. India was too big a country to visit each pocket physically—why not give the players an opportunity to reach out to him? During his playing days, he had come across a lot of Indians who were playing abroad and had access to better infrastructure and training. So they organized an overseas scouting trip to Dubai in June last year—a first for football in the country—with the aim of tapping players with Indian passports. Some 300 players turned up, and three were picked to join the Indian camp in Germany (though they didn’t make the cut eventually). To make things easier, Yadav also proposed an online portal where players could upload videos of their footballing skills. Since the portal was launched in September, the team has received 50-odd videos, including one of New Jersey-based Namit Deshpande, who has made it to the core team. “I had no idea whether it would be successful ya gaali milne wali hai (or I would be pulled up for it). We got videos from places such as the US, Ghana and Poland. The moment I saw Deshpande, I was confident he would make it. I had to get in touch with the parents, explain what we were doing, answer all their questions and give them the confidence that he would be okay. In fact, I was unable to convince the parents of a promising player in Dubai. So at times my job goes beyond the scouting," says Yadav. For now though, all the focus is on the U-17 squad. The sacking of Nicolai Adam as head coach in January—just eight months before the tournament—has raised a few concerns. After Luis Norton de Matos took over in March, he asked for more options that would suit his style of football. Yadav and his team had to go back to the drawing board, check their database and get players they thought would fit the bill. “It was a challenge to give him what he wants. But I also told the coach: India mein tumhe sab milega (You’ll get everything in India)," he says, laughing. “We had to go hunting for players who didn’t make the cut and see what they were up to. We brought in some nine players for another look. One moment, some of them were sitting for exams, and a few days later, they were training with the Indian team. What’s important is that the coach trusted us and gave them enough time to prove their worth," he says. Currently, the team is scheduled to play friendlies against U-17 national teams, and Yadav believes the results matter little as long as the team is progressing. The focus is on 6 October—the U-17 World Cup kick-off date—and, more importantly, on a road map for this set of players after the tournament. “No 16-year-old in this country has ever got the kind of exposure that these boys have. It’s important to integrate these players as part of the system, so that they can serve the country for the next 10 years," Yadav says. “The World Cup is of a high standard and we are trying our best to put on a spirited performance. These boys don’t come from a football set-up such as a Spain or a France, so when you analyse their performance, see where they come from and where they’ve reached. It requires that one event to trigger things, and not just in football. The U-17 World Cup is going to do just that for the sport in this country," he says. In that case, things should get a lot easier for the future Abhishek Yadavs of India.